The head of the International Olympic Committee has said anti-China protests had created a "crisis" but that the Games in Beijing would "rebound". Jacques Rogge told a meeting of national Olympic committees in Beijing that the Games would succeed. But Mr Rogge urged China to respect its "moral engagement" to improve human rights ahead of the Games. 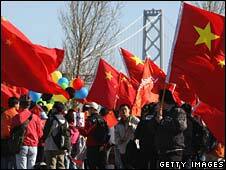 China said it hoped the IOC would steer clear of what it called "irrelevant political factors". "I hope IOC officials can eliminate all kinds of disturbance and continue to adhere to principles of the Olympic charter," foreign ministry spokeswoman Jiang Yu said. Demonstrators critical of China's rights record and the recent crackdown on protests in Tibet have disrupted the UK, French and US stages of the Olympic torch relay. The Dalai Lama - who many Tibetans regard as their spiritual leader - said on Thursday that China deserved to host the Games, but that protesters had the right to express themselves in non-violent ways. Also on Thursday, members of the European Parliament called on EU leaders to boycott the games if there was no resumption of dialogue between China and the Dalai Lama. Speaking in Beijing, Mr Rogge said: "It is a crisis. There is no doubt about that. But the IOC has weathered many bigger storms." He said Chinese officials had said that awarding the Games to Beijing would help advance social change in China, including human rights. Mr Rogge said he considered that "a moral engagement... and we definitely ask China to respect this moral engagement". However, addressing a joint meeting between the Association of National Olympic Committees and the IOC executive board, he said officials should reassure athletes. "Tell them that they are going to set an example and that the world will be watching them. We have 120 days to achieve that and I am sure it is going to be successful." In the US, both Democratic presidential hopefuls have called on President George W Bush to consider boycotting the Beijing opening ceremony if China does not improve its human rights record. "A boycott of the opening ceremonies should be firmly on the table but this decision should be made closer to the Games [in August]," Senator Barack Obama said a day after a similar call by Senator Hillary Clinton. The US House of Representatives has overwhelmingly passed a motion condemning China's "extreme" response to recent protests in Tibet. A spokeswoman for UK Prime Minister Gordon Brown said he would not be attending the opening ceremonies, but had never intended to do so and would be at the closing ceremony. The Olympic flame was lit in Greece on 24 March and is being relayed through 20 countries before being carried into the opening ceremony in Beijing on 8 August. The threat of protests has meant that torch-bearers have been immersed in a cocoon of security, surrounded by dozens of police officers and Chinese guards in track-suits. In Paris, the torch had to be extinguished three times because of safety concerns, while in London there were 37 arrests. 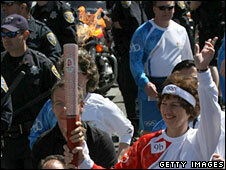 The US stage of the torch relay in San Francisco on Wednesday passed off amid confusion and tight security. Mr Rogge said he had been "saddened' by violent protests in Europe but he believed the San Francisco relay had been an improvement. "It was, however, not the joyous party that we had wished it to be," he added. Demonstrators also sought to disrupt the torch relay in Athens and Istanbul, while it passed successfully through Almaty, in Kazakhstan, and St Petersburg, in Russia. It is due to arrive in the Argentine capital, Buenos Aires, later this week.